Eight years of observations of millimeter-level vertical surface changes from a dense network of Global Positioning System (GPS) receivers in the Pacific Northwest tracks a fluctuating water load due to varying precipitation in the mountains and the valleys. The annual changes show seasonal variations (i.e., more rain or snow in the fall and winter). Monthly water load averages clearly denote the drought from 2008 to 2010 and the subsequent recovery from 2011 to 2012. The GPS data complements, corrects and enhances satellite data and hydrological models to strengthen water resource management. UNAVCO’s Plate Boundary Observatory (PBO) provides a dense network of GPS receivers in Washington and Oregon that measure crustal deformation at millimeter-level accuracy. The accurate and dense network is well suited to decipher the crustal response to a changing load of water on the surface (i.e., precipitation of rain and snow), when other factors such as tectonic forces and atmospheric signals are subtracted from the measurements. These hydrological measurements can be converted to water storage estimates and compared with satellite observations and hydrological models. 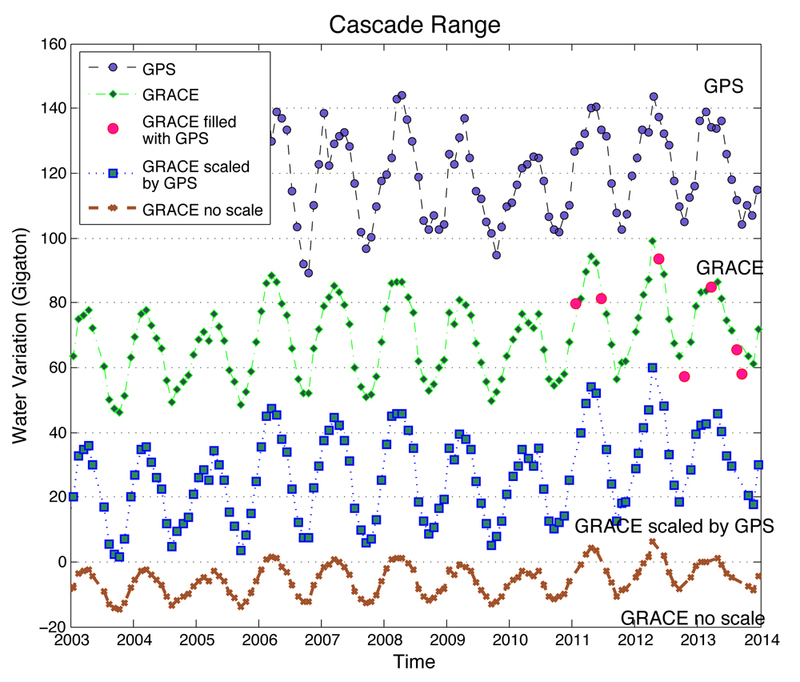 Continuous GPS data from more than 200 stations from 2006 to 2013 are collected and corrected for non-hydrological effects (i.e., atmospheric, oceanic and tectonic). The data are fit to different time periods to investigate interannual, annual and seasonal variations in water loads. 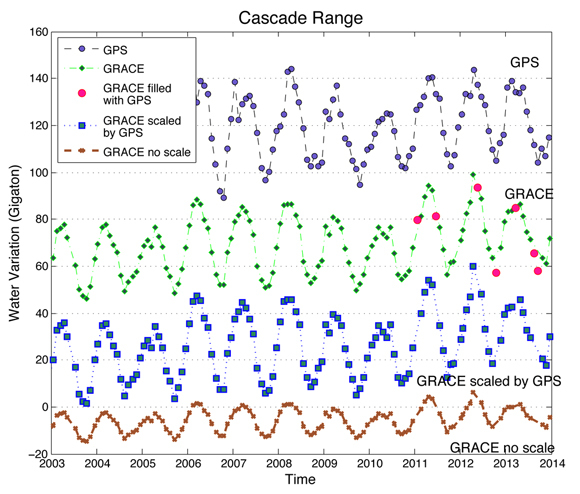 Then the GPS data are compared to measurements from the Gravity Recovery and Climate Experiment (GRACE) satellite and estimates from models (e.g., the North American Land Data Assimilation System [NLDAS-Noah] and a composite model constructed from NLDAS-Noah soil moisture and snow water equivalent from the Snow Data Assimilation System [SNODAS]). The Cascade Range, Olympic Mountains and Blue Wallowa Mountains show the largest increase and change in water load, consistent with the seasonal pattern of higher precipitation of rain and snow during the fall and winter in the mountains versus the valleys and basins. 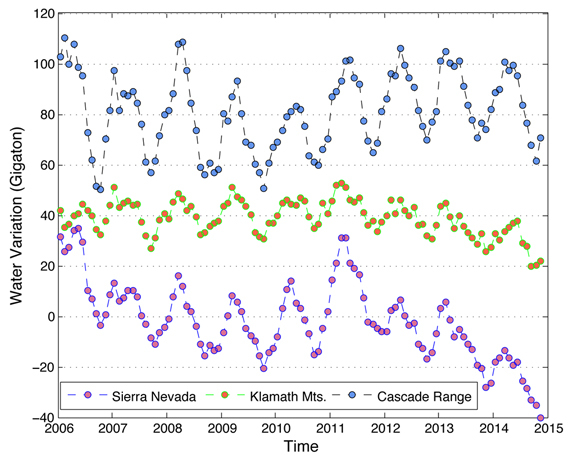 Besides the seasonal effects, the GPS data also show the drought in 2008 to 2010 and the recovery from the drought from 2011 to 2012. 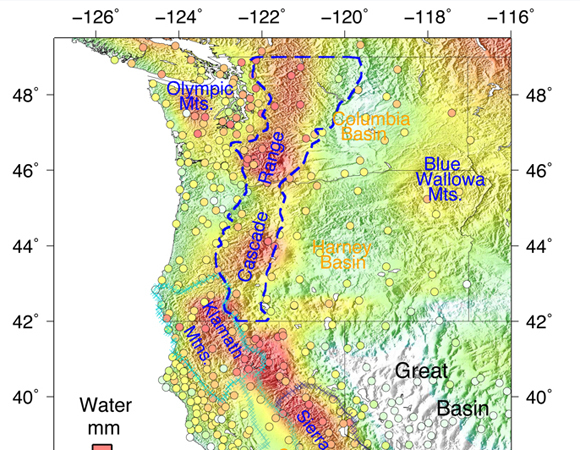 The GPS measurements provide an independent, accurate, dense and continuous tracking of the water load on the surface in Washington and Oregon; as such the network is another critical tool for water resource management. 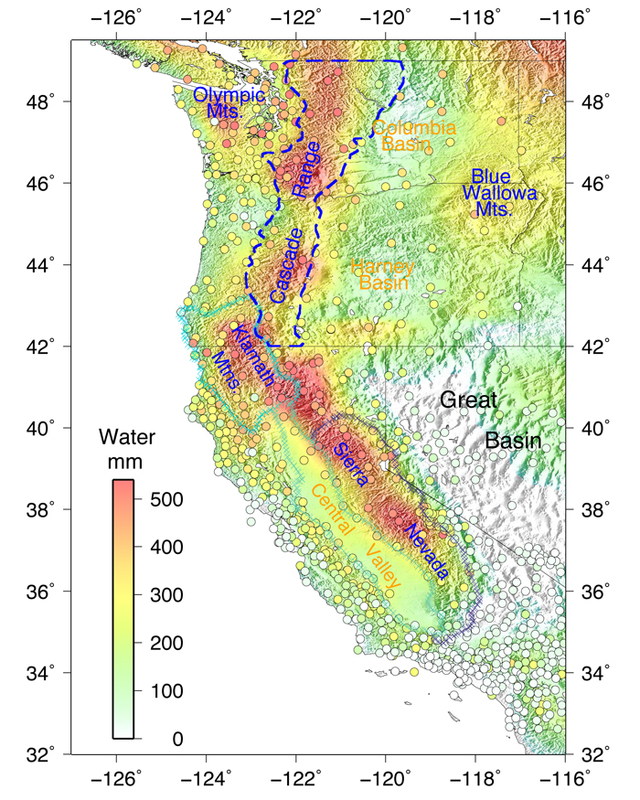 Fu, Y., D. F. Argus, and F. W. Landerer (2015), GPS as an independent measurement to estimate terrestrial water storage variations in Washington and Oregon, J. Geophys. Res. Solid Earth, 120, 552–566, doi:10.1002/2014JB011415.